From a young age, Sister Glynis Mary McManamon had a fascination with Eastern European culture. She grew up in Cleveland, Ohio, and it was there that she engaged with the city’s diverse population. Her love of Eastern European culture translates into the type of art she creates — Byzantine iconography. 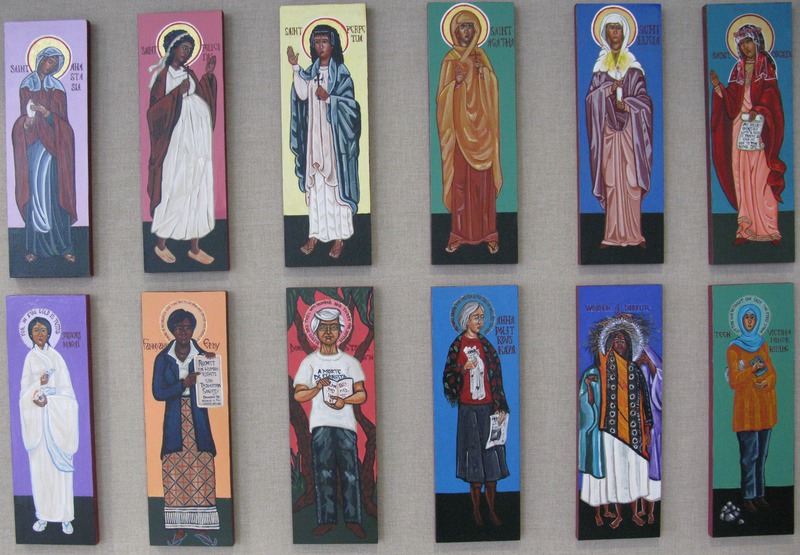 Her focus is the creation of sacred art featuring women and diverse ethnic groups. Her series Tested Fire — now on display at the North County Transit Center — is about the visibility of women and their heroism. McManamon uses acrylic, a medium commonly used by iconographers, to create her works. “Acrylic is a wonderfully flexible medium, and it can be ‘taught’ to act a bit like egg tempera, or a bit like watercolor, or somewhat like oil – depending on how it is used,” she said. McManamon spends most of her time painting. She currently serves as the Executive Director of the Good Shepherd Arts Center in Ferguson, which is dedicated to exhibiting art and offering experiences that affirm human dignity, uplift hearts and link creativity with spirituality.